It feels so good to be back. It’s the eve of Hari Raya Aidilfitri, and im all alone. My family decided to head to bed early and my boyfriend’s at his uncle’s, so instead of lying on the bed and staring at the ceiling, might as well do a blog post. 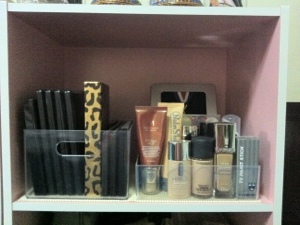 So tonight, i feel like doing an updated make up collection. Id add some storage tips if i can remember to talk about them. 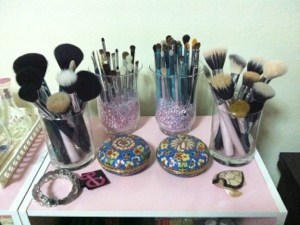 Please remember that i am not bragging in anyway, i enjoy collecting make up. Most of them are from my own money, and if not, they’re all gifts from family and friends. Lets get on to pictures! 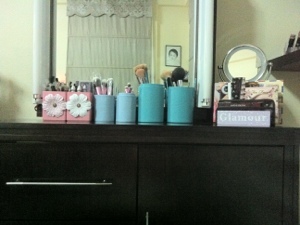 This is how my make up set up look like, same ol’ same ol’. This is the pink cupboard that i showed in my past post. I may have changed some stuff abit. 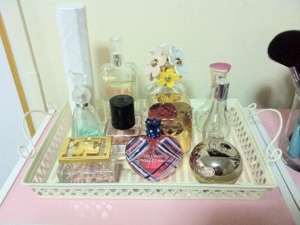 On the top of the cupboard, i got a vintage tray thing that i place all my perfumes. Under the perfumes, ive got 2 separate clear containers where i put all my lotions, body butters, Vaseline, body mist and make up cleansers. On the next cupboard, on top, that’s where i place all my clean brushes, two antique containers to put my most used earrings and watch. 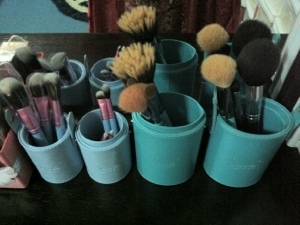 Under the brushes, theres two more clear containers where i have all my big coastal scents, NYX and manly palette inside. 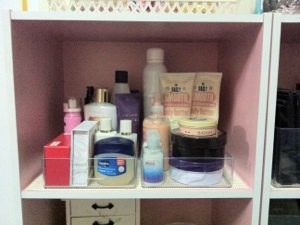 The other container contains all my bb creams, foundations and primers. 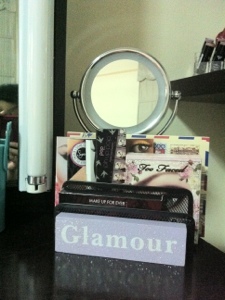 Here’s an overview of whats on my make up vanity. 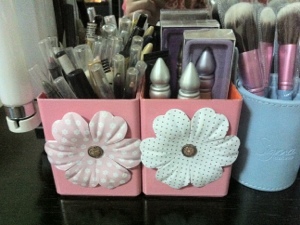 These are two pen holders that i spray painted pink and glued huge flowers on to make them look nicer. Inside one of them, i have all my eyeliners from various brands and milk jumbo pencils. In the other, i have all mu Urban Decay primer potions in different shades and Too Faced Glitter Glue. Next, here is where i have all my new palettes that i need to try/use. I just place them in letter holders. They fit there perfectly. Oh and at the back is my trusty ol mirror that i adore. 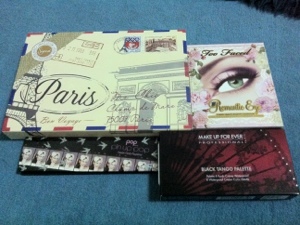 Here’s the palettes that I need to try out. Just incase you cant see them in the previous photo. 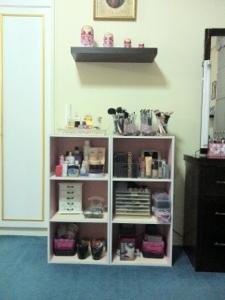 On the top shelf is where i have perfume sets that i got as gifts, boxes of hairbands and things like that. 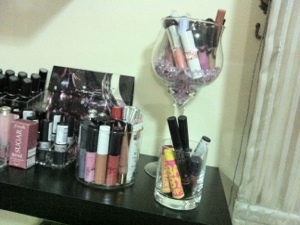 The shelf at the bottom is where I have all my lip stuff. 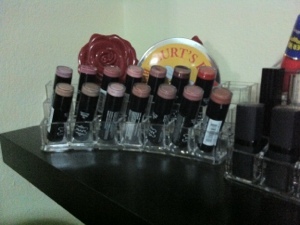 All from lipsticks to lip balms to lip glosses! In this acrylic lipstick holder, i have all my NYX round lipsticks, a mirror from Holika Holika and burts bees lipbalms in a tin can. Next, in this picture, ive got two sizes of acrylic lipstick holders, the tall one at the back holds all my MAC lipsticks and the three smaller ones in front are all my other lipsticks from various brands. 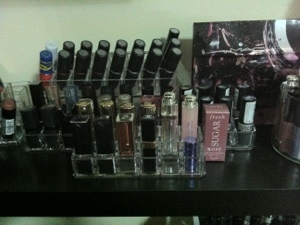 And here is where i have all my lip glosses. The two smaller glasses are actually candle holders that im already done with so that’s a nice tip if you want something fancy yet budget-able. So that’s all for part 1, I’ll be back with part 2.
thats a really nice collection!